In the Ontario curriculum we have many expectations (standards) that tell us students are expected to, “Determine through investigation…” or at least contain the phrase “…through investigation…”. In fact, in every grade there are many expectations with these phrases. While these expectations are weaved throughout our curriculum, and are particularly noticeable throughout concepts that are new for students, the reality is that many teachers might not be familiar with what it looks like for students to determine something on their own. Probably in part because this was not how we experienced mathematics as students ourselves! The chart shows 3 different teaching approaches and details for each (for more thoughts about the chart you might be interested in What does Day 1 Look Like). Hopefully you have made the connection between the Constructivist approach and the act of “determining through investigation.” Having our students construct their understanding can’t be overstated. For those students you have in your classroom that typically aren’t engaged, or who give up easily, or who typically struggle… this process of determining through investigation is the missing ingredient in their development. Skip this step and start with you explaining procedures, and you lose several students! At the heart of this is the idea of “productive struggle”, we want our students actively constructing their own thinking. However, I wonder if we could ever explain what “productive struggle” looks / feels like without ever experiencing it ourselves? How might the following graphic help us reflect on our own understanding of “productive struggle” and “engagement”? I think it would be a wonderful opportunity for us to share problems and tasks that allow for productive struggle, that have student reasoning as its goal, problems / tasks that fit into this “zone of optimal confusion”. In the end, we know that these tasks, facilitated well, have the potential for deep learning because the act of being confused, working through this confusion, then consolidating the learning effectively is how lasting learning happens! Let’s commit to sharing a sample, send a link to a problem / task that offers students to be confused and work through that confusion to deepen understanding. Let’s continue sharing so that we know what these ideals look like for ourselves, so we can experience them with our own students! Forty years ago, Richard Skemp wrote one of the most important articles, in my opinion, about mathematics, and the teaching and learning of mathematics called Relational Understanding and Instrumental Understanding. If you haven’t already read the article, I think you need to add this to your summer reading (It’s linked above). “Instrumental understanding” can be thought of as knowing the rules and procedures without understanding why those rules or procedures work. Students who have been taught instrumentally can perform calculations, apply procedures… but do not necessarily understand the mathematics behind the rules or procedures. “Relational understanding”, on the other hand, can be thought of as understanding how and why the rules and procedures work. Students who are taught relationally are more likely to remember the procedures because they have truly understood why they work, they are more likely to retain their understanding longer, more likely to connect new learning with previous learning, and they are less likely to make careless mistakes. Students who are taught instrumentally come to see mathematics as isolated pieces of knowledge. They are expected to remember procedures for each and every concept/skill. Each new skill requires a new set of procedures. However, those who are taught relationally make connections between and within concepts and skills. 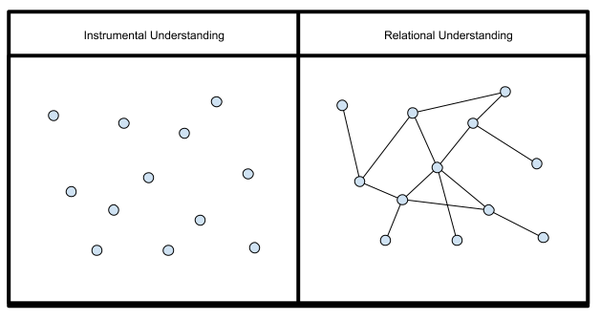 Those with a relational understanding can learn new concepts easier, retain previous concepts, and are able to deviate from formulas/rules given different problems easier because of the connections they have made. While it might seem obvious that relational understanding is best, it requires us to understand the mathematics in ways that we were never taught in order for us to provide the best experiences for our students. It also means that we need to start with our students’ current understandings instead of starting with the rules and procedures. Notice the top right quadrant for a second. If a child wants to learn instrumentally (they only want to know the steps/rules to solve today’s problem) and the teacher instead offers tasks/problems that asks the child to think or reason mathematically, the student will likely be frustrated for the short term. You might see students that lack perseverance, or are eager for assistance because they are not used to thinking for themselves. However, as their learning progresses, they will come to make sense of their mathematics and their initial frustration will fade. On the other hand, if a teacher teaches instrumentally but a child wants to learn relationally (they want/need to understand why procedures work) a more serious mismatch will exist. Students who want to make sense of the concepts they are learning, but are not given the time and conditions to experience mathematics in this way will come to believe that they are not good at mathematics. These students soon disassociate with mathematics and will stop taking math classes as soon as they can. These students view themselves as “not a math person” because their experiences have not helped them make sense of the mathematics they were learning. While the first mismatch might seem frustrating for us as teachers, the frustration is short lived. On the other hand, the second mismatch has life-long consequences! Phil Daro’s Against Answer Getting video highlights a few instrumental practices that might be common in some schools. Below is the “Butterfly” method of adding fractions he shares as an “answer getting” strategy. While following these simple steps might help our students get the answer to this question, Phil points out that these students will be unable to solve an addition problem with 3 fractions. These students “understand” how to get the answer, but in no way understand how the answer relates to addends. Tina Cardone and a group of math teachers across Twitter (part of the #MTBoS) created a document called Nix The Tricks that points out several instrumental “tricks” that do not lead to relational understanding. For example, “turtle multiplication” is an instrumental strategy that will not help our students understand the mathematics that is happening. Students can draw a collar and place an egg below, but in no way will this help with future concepts! Teachers focused on relational understanding again use representations that allow their students to visualize what is happening. Connections between representations, strategies and the big ideas behind multiplication are developed over time. Each of the above are developmental in nature, they focus on representations and connections. Learn more about how to move from instrumental to relational teaching. Align assessment practices to expect relational understanding. Goal 1 – Notice instrumental teaching practices. The rules/procedures shared here ask students to DO without understanding. The issue is that there are actually countless instrumental practices out there, so my goal is actually much harder than it seems. Think about something you teach that involves rules or procedures. How can you help your students develop a relational understanding of this concept? Goal 2 – Learn more about how to move from instrumental to relational teaching. I don’t think this is something we can do on our own. We need the help of professional resources (Marian Small, Van de Walle, Fosnot, and countless others have helped produce resources that are classroom ready, yet help us to see mathematics in ways that we probably didn’t experience as students), mathematics coaches, and the insights of teachers across the world (there is a wonderful community on Twitter waiting to share and learn with you). I strongly encourage you to look at chapter 1 of Van de Walle’s Teaching Student Centered Mathematics where it will give a clearer view of relational understanding and how to teach so our students can learn relationally. However we are learning, we need to be able to make new connections, see the concepts in different ways in order for us to know how to provide relational teaching for our students. Goal 3 – Align assessment practices to expect relational understanding. This is something I hope to continue to blog about. If we want our students to have a relational understanding, we need to be clear about what we expect our students to be able to do and understand. Looking at developmental landscapes, continuums and trajectories will help here. Below is Cathy Fosnot’s landscape of learning for multiplication and division. While this might look complicated, there are many different representations, strategies and big ideas that our students need to experience to gain a relational understanding. Asking questions or problems that expect relational understanding is key as well. Take a look at one of Marian Small’s slideshows below. Toward the end of each she shares the difference between questions that focus on knowledge and questions that focus on understanding. I hope whatever your professional learning looks like this year (at school, on Twitter, professional reading…) there is a focus on helping build your relational understanding of the concepts you teach, and a better understanding of how to build a relational understanding for your students. This will continue to be my priority this year!